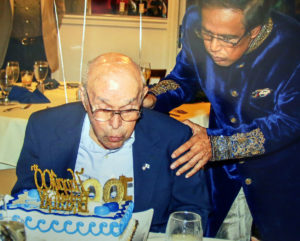 Dr. Shamsher Singh cheers on Pete Peterson as he blows out the candles on the cake for his 100th birthday party in December 2018. As a contractor, Osmond C. “Pete” Peterson was a major contributor to the construction of buildings and developments throughout Fort Pierce. Now at age 100, he also looks back to his important role as a flight navigator during World War II. Peterson was the celestial navigator for 48 missions, logging 3,500 hours during the war. He and his crewmen ferried planes, cargo and troops through dangerous skies to the Allies in Europe and Africa. 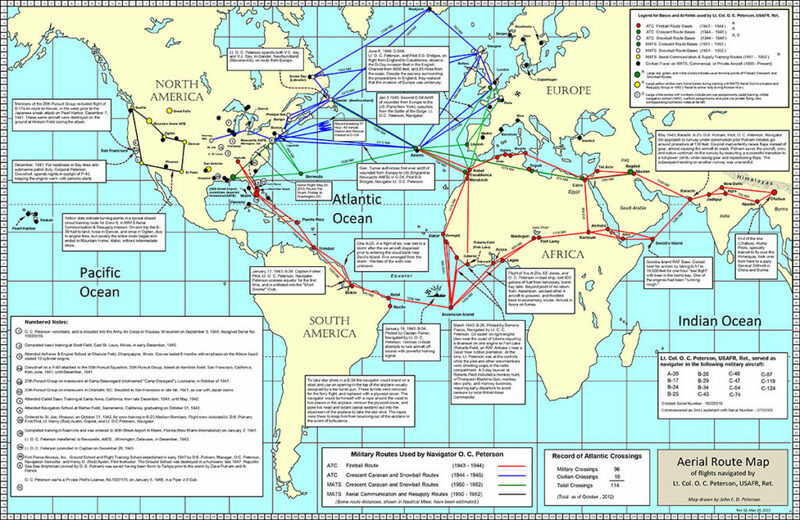 This chart from his book, My Dipper is Full, details the flights of celestial navigator Pete Peterson as he steered airplanes across the Atlantic Ocean during WWII. He was the navigator for 48 missions, including 114 Atlantic Ocean crossings in 15 different types of aircraft. They flew a load of gold to exiled Chinese leader Chiang Kai-shek, and on another flight they flew 56 American soldiers wounded in the Battle of the Bulge from France across the Atlantic Ocean to the U.S. When he wasn’t navigating, Peterson helped the nurses who treated the troops during the entire 30-hour flight. Blurry vision kept him out of the pilot’s seat, but Peterson took the suggestion that he become a navigator. One third of his class went on to the 8th Air Force, where many crews were shot down, their planes crashed or they ended up in German prison camps. One third were retained as instructors, and Peterson ended up in the third of the class that ferried planes to the war effort. Peterson flew missions on the Snow Ball route north to Russia and the Crescent Caravan to North Africa. But the most challenging route was the Fire Ball, which involved a series of hops through the Caribbean and down the coast of South America before the long leg from Brazil to Ascension Island for refueling and the last leg to a British base in Ghana. Peterson adjusted his sextant to use the stars for navigation out the gun turret for the correct heading. There is no margin of error when looking for tiny Ascension Island in the middle of the Atlantic Ocean. On one flight, Peterson gave the heading and the pilot said it was 15 degrees off what the radio homing signal said. “I told him, ‘You fly this heading for one hour and 15 minutes. If we haven’t found it, we will use the radio signal,’” Peterson says. His course was correct and after they landed, the crew learned a German submarine was emitting a more powerful homing signal and several planes had missed the island, crashing into the sea after running out of fuel. All of the men but the crew of one plane were rescued, Peterson says. Once, with his pilot throwing dice in the back with his crew, Peterson was at the controls over the Atlantic when the right engine blew. The plane pitched to the right before Peterson straightened it out. The frantic pilot jumped back into his seat, feathering the propeller on the dead engine, and the crew landed safely in Africa with the one good engine. The meticulous records kept by Peterson included one trip that took 72 hours from Karachi, Pakistan to Nashville, Tennessee. Peterson was navigator in a B-34, which had a plywood cap that would come off so he could stick his head out and get the reading. He had to be tied down on the left and right so unexpected turbulence wouldn’t pop him right out of the airplane. The day before the June 6, 1944, D-Day invasion of France, Peterson’s plane was ordered to fly farther from the coast, but the crew could see the massive armada of ships and knew what was going to happen next. When they weren’t flying, Peterson and his crew members danced with nurses in Paris, ate monkey stew in Africa and toured the Taj Mahal in India and the Great Pyramids of Giza in Egypt. After the war, Peterson was a first lieutenant and he stayed on in the Air Force Reserves. 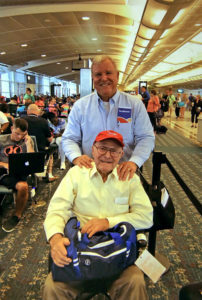 His longtime friend, pilot David Putnam, invited him to Fort Pierce, where he fell in love with the area and his future wife, Olive. Peterson was activated for duty in the Korean War, but he never left the country, ferrying airplanes around the mainland U.S. Enlisting in the original Army Air Corps as a private, he would retire from the U.S. Air Force as a lieutenant colonel. His family moved several times before settling back in Fort Pierce. Like his mechanically inclined father, Peterson had a second career as a contractor, building houses, subdivisions, gas stations, fruit stands and just about anything else people needed in Fort Pierce. A chance encounter with the late Alto “Bud” Adams led to a lifelong friendship as Peterson repaired a barn to begin with and then went on to construct new buildings and houses on the sprawling Adams ranch west of Fort Pierce. Former scoutmaster Pete Peterson and Eagle Scout son John are excited about their trip to Alaska. Over a 20-year period, the two men spent two weeks a year together camping, hunting, fishing and canoeing. Always a crack shot from his days at the Air Force shooting range, Peterson hunted with Adams for years. Both men made significant contributions to Heathcote Botanical Gardens in Fort Pierce, where Peterson built the Pioneer House. Peterson served on the county’s licensing board for years and one term on the school board, but he didn’t run again when he realized he couldn’t bring more vocational education to county schools. 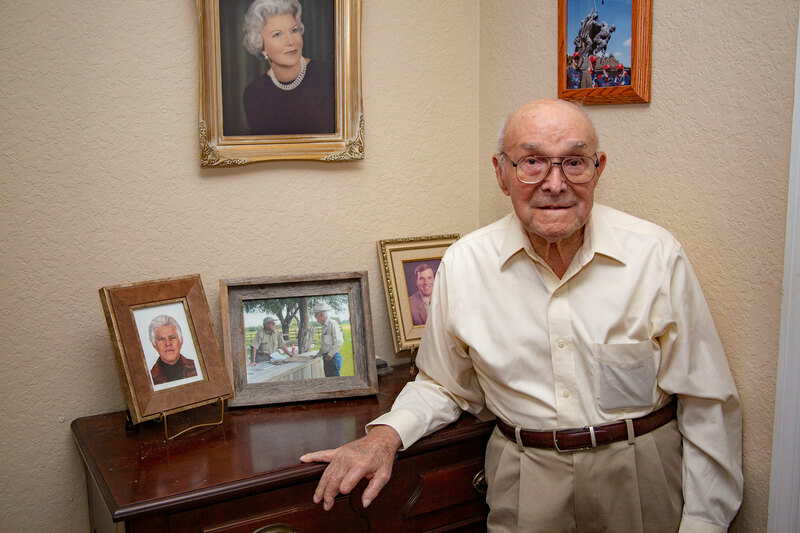 Peterson is the oldest member of the St. Lucie Historical Society. Asked how he lived to be 100, Peterson says with a smile, “Good whiskey and pretty women, although I was never one to stray on my wife.” A career history teacher in St. Lucie County, Olive Peterson wrote what is widely considered the comprehensive biography of her friend, the late artist A. E. “Bean” Backus. The Petersons were married almost 60 years before she passed away at age 93. 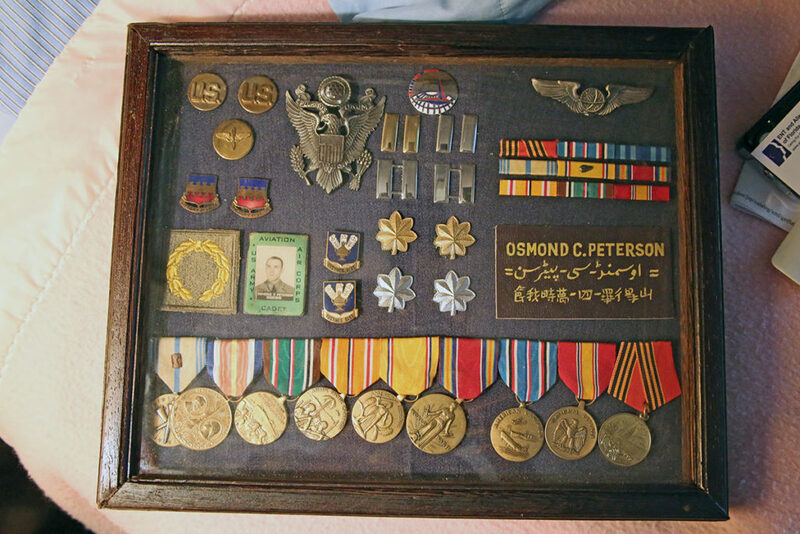 For a visitor to his room, Peterson pulls from a drawer a case with all his military ranks, insignias and medals, including one from the Russian government for his role in ferrying airplanes to the Army. He also has two sets of ranks – one for the Army Air Corps and later the U.S. Air Force. Considering the history of longevity in his family, it may be a while before that happens.